The Hawaiʻi Supreme Court heard oral arguments today for a case challenging the issuance of the Conservation District Use Permit by the Board of Land and Natural Resources to the University of Hawaiʻi at Hilo for the TMT project. Oiwi TV. The legal battle over the controversial Thirty Meter Telescope drew a step closer to resolution Thursday when the state’s highest court heard oral arguments in the case. Star-Advertiser. Hawaii Supreme Court justices expressed skepticism about the state Land Board’s process of approving construction of the Thirty Meter Telescope on Mauna Kea during oral arguments in a case challenging the state’s endorsement of the $1.4 billion project. The justices grilled state attorneys Thursday about whether the Board of Land and Natural Resources was wrong to approve a permit for the project in 2011 prior to holding a contested case hearing. Civil Beat. Attorneys representing the state, the University of Hawaii and opponents of the planned Thirty Meter Telescope project presented their cases in oral arguments before the Hawaii Supreme Court in Downtown Honolulu Thursday morning. Pacific Business News. Hawaii’s Supreme Court has heard oral arguments in a case involving building one of the world’s largest telescopes on Mauna Kea. Opponents are challenging a permit allowing the telescope to be built on conservation land. Associated Press. 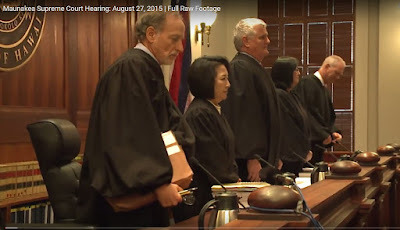 Hawaii Supreme Court hears Mauna Kea telescope case. KITV4. Long before dozens of people were arrested while protesting against building a giant telescope atop Hawaii’s Mauna Kea, there were years of environmental studies, public hearings and court proceedings. Associated Press. The chair of the Mauna Kea advisory group to the University of Hawaii said he is offended by Governor David Ige’s request that the management of 10,000 acres of mountain land leased by UH be returned to the jurisdiction of the State Department of Land and Natural Resources. Big Island Video News. Hurricane Ignacio has maintained its speed in the Central Pacific as its track takes the storm near the Hawaiian islands. The National Hurricane Center said at 5 a.m. Friday, Ignacio was located approximately 840 miles east-southeast of Hilo. Hawaii News Now. The Hawaii State Teachers Association is challenging the Ethics Commission’s stance that public school teachers may not travel free as chaperones on students’ educational field trips that they organize with tour companies. Star-Advertiser. Establishing direct flights between Honolulu and Hong Kong and London are the top priorities for Hawaii visitor industry leaders when it comes to establishing air service with underserved international markets, according to an informal poll taken Thursday at the state's annual tourism conference. Pacific Business News. Hawaii Gov. David Ige said Thursday it’s a top priority for Hawaii that the U.S. be able to process Japanese travelers for immigration and customs before they even get on a plane for the islands. Associated Press. Hawaii’s largest interisland cargo carrier has encountered what it hopes is the first ripple of a rebound in goods it transports between islands. Star-Advertiser. The United Health Foundation ranks Hawai‘i number 1 among states in overall health, crediting us with double digit decreases in smoking and binge drinking in the last two years. Still, 22% of Hawai‘i’s population is considered obese, a situation three fitness buffs are trying to address. Hawaii Public Radio. For a second consecutive month, those overseeing Honolulu’s rail project have held off approving a nearly $9 million delay claim for Ansaldo Honolulu, the firm that’s creating the elevated transit system’s rail cars and operating system. Star-Advertiser. Time is now running out for 20 to 25 people who, if still living on the outer edges of the Kakaako homeless encampment Sept. 8, will be rousted from their makeshift homes in the first sweep since conditions there sparked renewed efforts to address Oahu’s homeless problem. Star-Advertiser. Honolulu Mayor Kirk Caldwell announced Thursday that the city will resume the enforcement of the storage property and sidewalk nuisance ordinances in the Kakaako homeless encampment after Labor Day. Civil Beat. Honolulu Mayor Kirk Caldwell defended his administration's effort to shore up areas of Waikiki during a tourism industry event held on Thursday, including recent city efforts to continually raise funds for replenishing sand on Waikiki beaches that are lost to erosion. Pacific Business News. The first partial sweep of the Kaka‘ako homeless encampment will take place the day after Labor Day. Mayor Kirk Caldwell says notices will be given to people living there next Monday—telling them to leave. The area is a small portion of the Kaka‘ako Waterfront where about 20 to 25 people are living. Hawaii Public Radio. Environmental groups are calling for updates to Hawaii's wastewater systems in the wake of two beach closures due to sewage from a treatment plant spilling near the ocean. Associated Press. UH Manoa study points to bacteria left in sand post-sewage spill. KITV4. When nearly half a million gallons of raw sewage poured into Ala Moana Beach Park on Monday, the city tested nearby areas for bacteria levels caused by the sewage spill. But it didn't test for sewage in Waikiki that day. Hawaii News Now. About 1 million gallons of treated but not yet disinfected wastewater have spilled on the Windward Shore, forcing health officials to close beaches from the Halona Blow Hole to Erma’s Beach on Thursday. Civil Beat. The Environmental Protection Agency is taking the next step in addressing questions about the Navy’s Red Hill fuel storage facility. More than 140 comments were received during the public comment period over the Navy’s Administrative Order on Consent to repair and maintain the facility. Hawaii Public Radio. A veil of secrecy was drawn tightly around a hearing Wednesday and Thursday over pay and benefit packages for the county’s 14 Fire Department battalion chiefs, who say their compensation has not kept pace with their unionized counterparts in the department. West Hawaii Today. The Big Island’s first hydrogen production facility, part of a $5 million demonstration project, will be built in Kona rather than Puna. Tribune-Herald. The Queen’s Health Systems is in discussion with Kona Community Hospital about a potential partnership on Hawaii's Big Island. Pacific Business News. The public will soon have vehicle access to part of a massive forest reserve on the southeastern slopes of Mauna Loa. West Hawaii Today. A new lava flow has started pouring from Kilauea's Pu'u O'o vent on the Big Island. The breakout first started early Thursday morning and is headed in a new direction. Hawaii News Now. Hawaiian Commercial & Sugar Co. sought flexibility in the amount of scheduled guaranteed power it would supply Maui Electric Co. during recent power purchase agreement negotiations because the sugar plantation said it needs to trim its use of coal and other fossil fuels and to improve its operations, according to a filing with the state Public Utilities Commission last week. Maui News. The landmark Buzz's Wharf Restaurant, which closed last year, may be leveled after nearly 50 years at Maalaea Harbor to make way for dry dock space and increased boat traffic. Maui News. The Maui Ocean Center plans to release six juvenile green sea turtles into the open sea this afternoon to continue their life in the wild. Maui Now. Six juvenile turtles were released from the Ali'i Nui tour boat in a private ceremony for aquarium staff, members of the Hawaii marine science community and dignitaries.Maui News. U.S. Sen. Brian Schatz, D-Hawaii, shared his thoughts on this and other topics he is working on in Washington, D.C. during a wide-ranging discussion with the Lihue Business Association Thursday morning, and he also sat down for an interview with The Garden Island. The beach fronting the St. Regis Princeville Resort reopened following a 2,000 gallon sewage spill caused by a broken line. Garden Island. The Public Utilities Commission has approved Sea Link of Hawaii's proposed changes to its sailing schedule and operations to help keep the Molokai ferry afloat. Maui News.